BANANA KINGDOM, It is a very scenic site over a mountain having the main Narmada water canal on one side and four lane Ahmedabad Indore highway on the other side. 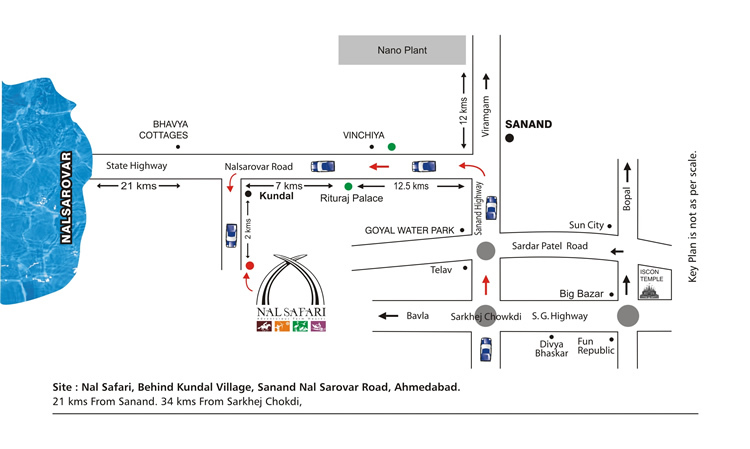 Located on the eastern side of Ahmedabad, near kathlal. Theme park based on an elevated plateau is designed for adventure lovers offers a range of adventure sports along with entertainment. This was a new concept of giving all four sides open in Aparment living. One floor one flat idea had been apreciated a lot. This scheme is located near the St xaviers loyola hall school near Navrangpura. This Project Rituraj Palace Resort stands on the way to world famous bird sanctuary, Nalsarovar. It is located at the entrance of the plotting scheme called Rituraj Village. The resort has picturesque heritage façade made out of carved stone and colorful glasses. The palace is surrounded with tranquil lush green environs, a cozy enclave where you truly feel one with nature in a breathtaking pollution free hideaway. The building is having a modern facade with earthen colored stones having offices and showroom in the heart of the city near C G road, the leading commercial area of the city. The company has its own office on the top floor of the building with beautiful terrace garden.